This past Monday, on the feast of the Holy Innocents, our little Rose was baptized, according to the Traditional Rite, by one of her uncles. 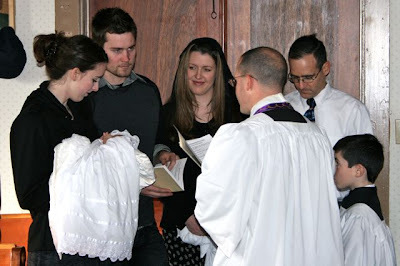 Her Godparents were not able to make it to the baptism, so two of my siblings stood in as proxies. After the baptism we were talking about how she started crying/screaming during the exorcism and stopped immediately after the following Imposition of Hands. Father said, "Who knows, maybe her heart is all better now that she is baptized!" Interestingly enough, yesterday afternoon she had her 2 week appointment, and even though just last week (when I had her checked for jaundice) the doctor reconfirmed that her heart still had the murmur he could NOT hear it yesterday!!!! He kept checking and then tapping his stethoscope and then checking again, before finally giving up and saying he just couldn't hear it anymore. I guess we will see at her next echocardiogram, but I'm thinking the holes may already be closed/closing thanks to all of the prayers and her baptism! God is so good! The priest (wearing a violet stole), sponsors, and the catechumen stand in the narthex of the church, symbolizing that at this point, the candidate is not a member of the Church. Priest: N., what do you ask of the Church of God? Priest: What does Faith offer you? The priest then breathes 3 times on the candidate in the form of a Cross, recalling the Spirit (breath, wind, "ruach") of God. Priest: Go forth from her, unclean spirit, and give place to the Holy Spirit, the Paraclete. The priest now makes the Sign of the Cross with his thumb on the candidate's forehead and breast. 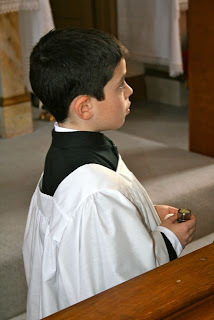 Priest: Let us pray: Mercifully hear our prayers, we beseech Thee, O Lord; and by Thy perpetual assistance keep this Thine elect, N., signed with the sign of the Lord's cross, so that, preserving this first experience of the greatness of Thy glory, she may deserve, by keeping Thy commandments, to attain to the glory of regeneration. Through Christ our Lord. The priest places his hands on the candidate's head. Priest: Let us pray: Almighty, everlasting God, Father of our Lord Jesus Christ, look graciously down upon this Thy servant, N., whom Thou hast graciously called unto the beginnings of the faith; drive out from her all blindness of heart; break all the toils of Satan wherewith she was held: open unto him her, O Lord, the gate of Thy loving kindness, that, being impressed with the sign of Thy wisdom, she may be free from the foulness of all wicked desires, and in the sweet odor of Thy precepts may joyfully serve Thee in Thy Church, and grow in grace from day to day. Through the same Christ our Lord. Amen. Priest: Through the same Christ our Lord. Now the priest puts a little blessed salt in the candidate's mouth. Salt is the symbol of that wisdom which gives a relish for the sweetness of divine nourishment; preserves, by the teaching of the Gospel, from the corruption of sin, and prevents evil passions from growing in men's souls. Adult catechumens might be signed on the brow, ears, eyes, nostrils, mouth, breast, and between the shoulders before the imposition of salt. If this procedure is followed, afterwards the candidate will kneel, recite the Our Father several times, and a Cross is made on his forehead, first by the sponsor and then by the priest. Priest: N., Receive the salt of wisdom; let it be to thee a token of mercy unto everlasting life. May it make your way easy to eternal life. Priest: Peace be with you. Sponsor/Catechumen: And with your spirit. Priest: Let us pray: O God of our fathers, O God the Author of all truth, vouchsafe, we humbly beseech Thee, to look graciously down upon this Thy servant, N., and as she tastes this first nutriment of salt, suffer her no longer to hunger for want of heavenly food, to the end that she may be always fervent in spirit, rejoicing in hope, always serving Thy name. Lead her O Lord, we beseech Thee, to the laver of the new regeneration, that, together with Thy faithful, he may deserve to attain the everlasting rewards of Thy promises. Through Christ our Lord. Priest: I exorcise thee, unclean spirit, in the name of the Father + and of the Son, + and of the Holy + Ghost, that thou goest out and depart from this servant of God, N., For He commands Thee, accursed one, Who walked upon the sea, and stretched out His right hand to Peter about to sink. Therefore, accursed devil, acknowledge thy sentence, and give honor to the living and true God: give honor to Jesus Christ His Son, and to the Holy Spirit; and depart from this servant of God, N., because God and our Lord Jesus Christ hath vouchsafed to call her to His holy grace and benediction and to the font of Baptism. The priest again makes the Sign of the Cross on the candidate's forehead. Priest: And this sign of the holy Cross, which we make upon her forehead, do thou, accursed devil, never dare to violate. For the final time, the priest lays his hand on the candidate's head. Priest: Let us pray: O Holy Lord, Father Almighty, Eternal God, Author of light and truth, I implore Thine everlasting and most just goodness upon this Thy servant N., that Thou wouldst vouchsafe to enlighten her with the light of Thy wisdom: cleanse her and sanctify her, give unto her true knowledge; that, being made worthy of the grace of Thy Baptism, she may hold firm hope, right counsel and holy doctrine. The priest lays the end of his stole on the candidate as a symbol of his priestly authority, and admits him into the church building, which is the symbol of the Church of Christ. If the catechumen is an adult and was anointed in Part I above, he may be asked to lie prostrate before the Altar in adoration of Christ before this next step. Sponsor/Catechumen: I believe in God the Father Almighty, Creator of heaven and earth, and in Jesus Christ his only Son our Lord, who was conceived by the Holy Ghost, born of the Virgin Mary; suffered under Pontius Pilate, was crucified, dead, and buried. He descended into Hell. On the third day, He rose again from the dead. He ascended into heaven, and sitteth at the right hand of God the Father Almighty; from thence shall He come to judge the living and the dead. I believe in the Holy Ghost, the holy Catholic Church; the communion of saints; the forgiveness of sins; the resurrection of the body, and life everlasting. Amen. Sponsor/Catechumen: Our Father, who art in heaven, hallowed be thy name. Thy kingdom come. Thy will be done on earth as it is in heaven. Give us this day our daily bread. And forgive us our trespasses, as we forgive them that trespass against us. And lead us not into temptation: but deliver us from evil. Amen. Priest: I exorcise thee, every unclean spirit, in the name of God the Father + Almighty, in the name of Jesus + Christ, His Son, our Lord and Judge, and in the power of the Holy + Spirit, that thou be depart from this creature of God N, which our Lord hath deigned to call unto His holy temple, that it may be made the temple of the living God, and that the Holy Spirit may dwell therein. Through the same Christ our Lord, who shall come to judge the living and the dead, and the world by fire. The priest takes a little spittle and touches the ears and nostrils of the candidate with it. For health reasons, the use of spittle may be omitted. This rite comes from Mark 7:33-35, when Jesus healed the deaf-mute: "And taking him from the multitude apart, he put his fingers into his ears: and spitting, he touched his tongue. And looking up to heaven, he groaned and said to him: Ephpheta, which is, Be thou opened. And immediately his ears were opened and the string of his tongue was loosed and he spoke right." Priest: Ephpheta, that is to say, Be opened, for an odour of sweetness. Be thou, devil, begone; for the judgement of God shall draw near. Priest: Do you renounce Satan? Sponsor/Catechumen: I do renounce him. Priest: And all of his works? Priest: And all his pomps? Priest: I annoint you + with the oil of salvation in Christ Jesus our Lord, that you may have everlasting life. 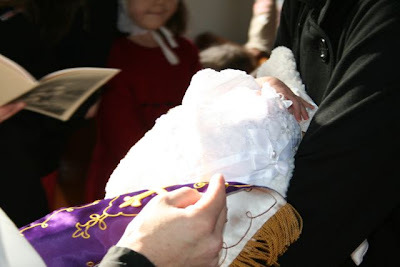 The priest removes his violet stole and puts on a white one. Priest: N., do you believe in God the Father Almighty, Creator of Heaven and Earth? Priest: Do you believe in Jesus Christ, His only Son our Lord, Who was born and Who suffered? Priest: Do you believe in the Holy Ghost, the Holy Catholic Church, the communion of Saints, the forgiveness of sins, the resurrection of the body and life everlasting? 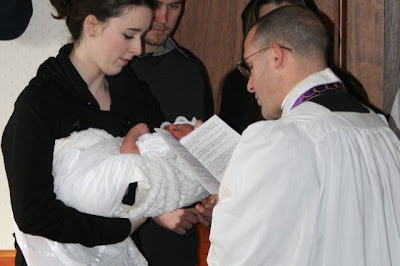 If the one to be baptized is a baby, the godparents take him to the font (the godmother holds him in her arms, the godfather touches the baby's shoulder with his right hand); if he is an adult, the sponsor puts his right hand on the shoulder of the one to be baptized. Priest: N., will you be baptized? Priest: I baptize you in the name of the Father + and of the Son + and of the Holy + Ghost. Priest: May the Almighty God, the Father of our Lord Jesus Christ, Who hath regenerated thee by water and the Holy Ghost, and who hath given thee the remission of all thy sins, may He Himself + anoint thee with the Chrism of Salvation, in the same Christ Jesus our Lord, unto life eternal. This priest takes a white linen cloth -- symbolizing the purity of a soul cleansed from all sin, and a relic of the days when the newly baptized wore white albs for 8 days -- and places it on the head of the candidate. 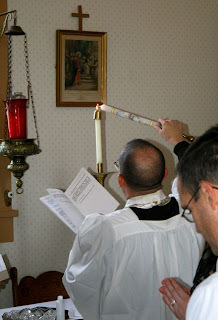 The priest gives the candidate or the sponsor a lighted candle. 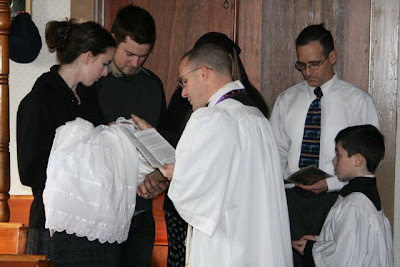 Priest: Receive this burning light, and keep thy Baptism so as to be without blame: keep the commandments of God, that when the Lord shall come to the nuptials, thou mayest meet Him together with all the Saints in the heavenly court, and mayest have eternal life and live for ever and ever. Thanks be to God that her holes may have closed already! What a beautiful service. Thanks for the transcription. That must have taken some time. congratulations on your little saint! God be blessed. I will continue to pray for your Rose, but I have a feeling that God has worked his Hand in this. Beautiful! Thank you so much for sharing. 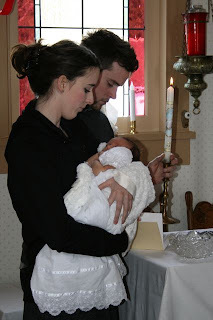 Our son, Henry, was supposed to be baptized last year on the Feast of the Holy Innocents. The Lord instead chose to gather our son to Himself shortly before his birth. It was very touching for me to have a glimpse into the sacred baptism of your daughter on this feast day. May God continue to bless your family. Our prayers continue for your little Rose! What a blessed, blessed day! Welcome to the family, Baby Rose! And what wonderful news about her heart! Deo Gratias!!! Thank you for posting the beautiful pictures so we could catch a glimpse of your glorious day. Thanks so much for posting this Jessica. We will keep praying for your beautiful little Rose. Happy New Year!! It looks like it was a beautiful ceremony! Thank you for sharing it - I have never attended a Traditional Rite baptism before so was very interested to read through it all! I noticed you commented that this is the English translation... is everything said in Latin during the baptism? Erin ~ That was the first thing my brother asked Father! =) He was relieved to hear that even though the prayers are indeed in Latin, all the questions and responses between the priest and the Godparents are in English. Just beautiful! Yes, Deo Gratias! Breathtaking! I've never seen the Traditional form before for Baptism! Still hankering for a phone date! When Annelise starts sleeping better, or at least more predictably, I'm calling you! It was such a beautiful baptism! And I am so happy for beautiful Rose and all of you. Hope you guys have a blessed New Year! Breathtaking! Thank you so much for sharing this with us! How lovely your family photo is also! Beautiful family, a fabulous day shared for all to feel as though we were present with you all. How beautiful and impressive and serene! You are truly blessed! 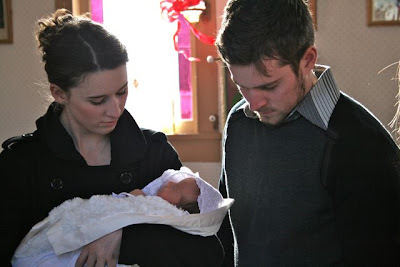 What a beautiful ceremony and family and baby! 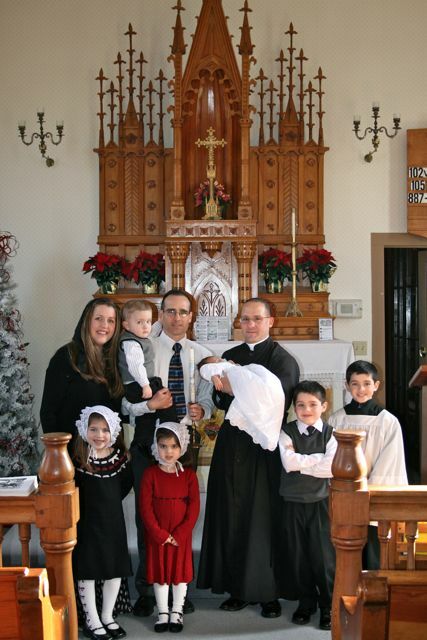 It makes me sad to think we cannot all be benefactors of such beautiful traditions and how much we all long for them. Blessings to you and your lovely family! How lovely! Rose is just beautiful! this has GOT to be the most beautiful post EVER!!! I'm tearing here! Thank you for your beauty and faithfulness Jessica! You are a blessing to so many. Welcome Little Rose to the Family of God!! How wonderful Jessica! She looks like a doll baby! Kiss her sweet forehead for me.. all the way from Texas!! What a beautiful day, God bless! !